From Sept. 23–28, Dean of Men Mr. Dan Annarelli, Community Service Program Coordinator Mrs. Angela Moran and theology teacher Ms. Tika Lee led 17 students on a trip to Philadelphia to see Pope Francis and experience the end of his historic visit to the United States at the World Meeting of Families. Over the course of five days, the Loyola delegates attended a number of breakout sessions, lectures and keynote speeches at Mr. Annarelli’s alma mater, Saint Joseph’s Preparatory School, the only Jesuit high school in the city. Cubs joined over 300 students representing 42 other Jesuit Schools across North America. Mr. Annarelli said that he thinks it is important for the students to take part in this discussion about family. Senior Adrian Sibal said that he especially enjoyed the lectures presented by the Jesuit Secondary Education Association (JSEA) at Saint Joseph’s High School. In addition to attending the conference, Mr. Annarelli and Ms. Lee guided the students on a campus tour of Villanova University. “I’m from Philadelphia and it meant the world to me to be able to take students to my hometown,” said Mr. Annarelli. The group attended the Pope’s address at World Meeting of Families on Saturday at Independence Mall, where some Cubs spent four hours standing along the barricades hoping for pictures of the pontiff. The conference concluded on Sunday, Sept. 27, with a city-wide liturgy officiated by Pope Francis. The students waited in the general admission line four hours for the event. Ms. Lee said she hoped that the students would grow emotionally and spiritually during the conference. “I hoped the students would realize and understand that Pope Francis is a living embodiment of the care, concern and love that Jesus taught us all. I truly believe he is a living saint,” said Ms. Lee in an emailed statement. 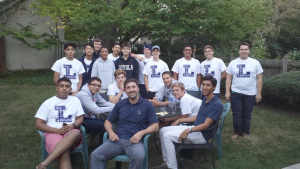 Furthermore, both Ms. Lee and Mr. Annarelli said that they are excited to see how the students bring what they learned at the conference back to Loyola and the surrounding community. To view pictures, videos and Tweets from the event, students can search under the hashtags, #2P4F, #2Philly4Francis and #cubs2philly4francis, and can visit Mr. Annarelli’s Twitter, @Deanarelli.